Woodcraft Designs employs a team of immensely talented carpenters who have undergone rigorous training, making us your go-to fitted wardrobe suppliers. They have access to cutting edge equipment and facilities to offer you quality custom-built wardrobes. If you’re looking for something to enhance your bedroom at an affordable price then contact us today. We have a host of custom bedroom wardrobe ideas that are sure to do the trick. From concept to installation Before we undertake any project, we always take the time to understand every detail of your expectations and what you want. This allows us to plan a way forward and take all the necessary measures to ensure your needs are met. After determining the scale and measurements required, our dedicated designers will capture all the information in 3D generated drawings that offer a true reflection of your preferences. Once this has been agreed upon, our carpenters will go to work on producing your custom-built wardrobe using state-of-the-art machinery. Finally, we’ll carry out the installation taking care to cause minimal disruption to your bedroom. From designers to craftsmen, project managers and interior designers every member is committed to producing a quality finish for you. Unlike regular wardrobes that aren’t made with your specific needs in mind, custom bedroom wardrobes are designed with your preferences in mind which means they have the capacity to complement your bedroom and its furniture. There are few things more frustrating than not having enough room for your clothes, particularly if you find it difficult to part with some of your more sentimental items. 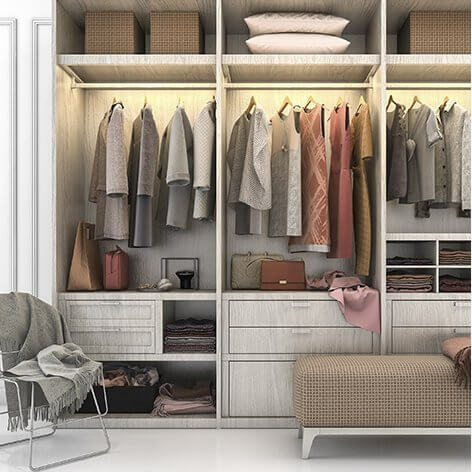 A made-to-measure wardrobe will accommodate all your clothing comfortably and save you the hassle of trying to find a new home for some of your garments. Whether you’re looking for something small, quaint and functional or something large, luxurious and extravagant, custom wardrobes will appeal to you. They offer the unique satisfaction of giving you the wardrobe experience you have always wanted each time you use it. What’s more, they are manufactured from a range of materials to suit your tastes. Bonus tip We are always on hand to offer guidance and built-in wardrobe design ideas. A great way to enhance your built-in wardrobe is to take the less-is-more approach. For example, foregoing any doors for easy access to your clothes or foregoing drawers. Foregoing drawers will help reduce costs, assist with the scope of your layout and make for more efficient use of space. For more advice, hints and tips on custom bedroom wardrobes, contact us today.